The numbers give comprehensive multidimensional insight into LTSS in our country. Our goal is for the Scorecard to stimulate a dialogue among key stakeholders, encouraging them to collaborate on strategies for improving a given state’s LTSS system. Overall, states have made incremental improvements, but must pick up the pace of change to meet the needs of a growing number of people aging and living with disabilities. The pace of change on most indicators has been slow and uneven. While there has been more improvement than decline, few states achieved meaningful change—typically defined here as 10 percent or more over the past two to four years—on most of the 23 measures that can be tracked over time. Most notably, the majority of states had no meaningful change in each of the five measures in the Affordability and Access dimension. The cost of LTSS over time remains much higher than what middle-income families can afford, and most adults do not have private long-term care insurance. There are, however, some areas of progress. In four out of the five dimensions, there was at least one indicator on which most states showed significant improvement. This slow pace of change is juxtaposed with the increasing number of adults with disabilities seeking greater independence in their communities and the older population, with 10,000 people in the United States turning age 65 every day. More of our nation’s population will live well into their 80s—an age at which there is considerable demand for LTSS. The new #1 ranked state is Washington, but even top-ranked states can improve performance. Washington and Minnesota have ranked as the top 2 states in every Scorecard. In the previous two Scorecards, Minnesota was ranked #1, with Washington #2. In this third Scorecard, Washington edges out Minnesota for the top slot, followed by Vermont, Oregon, and Alaska. Despite this progress, all of the states—including those at the top—can improve on one or more of the five dimensions of performance. The states with the greatest improvement are Tennessee and New York. These are the only two states that improved significantly on more than half of the indicators for which performance could be tracked over time. Tennessee improved on 13 of 23 such indicators, and New York on 12 out of the 23. Despite these improvements, the overall ranking of New York went up from #25 in the 2014 Scorecard to #20, and Tennessee increased only from #48 to #47. The main reason for this is that LTSS system performance varies dramatically between states. Even the most-improved states must significantly pick up the pace of change to achieve the level of performance demonstrated by Washington, Minnesota, and other high-performing states. Top- and bottom-ranked states generally have stayed the same over time. Washington, Minnesota, Oregon, Wisconsin, Hawaii, and Colorado have stayed in the top 10 across all three editions of the Scorecard. Indiana, Kentucky, Alabama, Mississippi, Tennessee, Florida, West Virginia, and Oklahoma have remained in the bottom 10 across the three Scorecards. Geographically, the high-performing states are spread throughout the Pacific, West, and Upper Midwest while the poor-performing states are concentrated in the South. Inappropriate Antipsychotic Use. Almost all states (48) significantly reduced the use of antipsychotic medications that are given “off label” for nursing home residents who do not have the appropriate conditions for their use. Although these are positive results, antipsychotics are still potentially prescribed inappropriately to more than one out of six nursing home residents. Most of the progress has been around passage of the CARE Act and caregiver assessments—that is, asking questions of the family member about his or her own health and well-being and any services or support he or she may need to be better prepared for caregiving. At the time of writing, 35 states and territories had passed the CARE Act. Since 2013, 15 additional states implemented family caregiver assessments, bringing the total to 33 states. However, only 7 states permit a spouse who lives in the community to keep the maximum Medicaid amount of income and assets per month allowable under federal guidelines. Long-Term Nursing Home Stays. 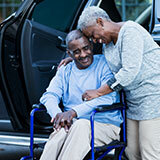 Most people who leave nursing homes do so in the first few weeks of admission. Once individuals stay in a nursing home for 100 days or longer, they are likely to become permanently institutionalized. About two-thirds of states (35) improved significantly in reducing the percentage of long-term nursing home stays of Medicare beneficiaries that last 100 days or more. There is significant variation between states, ranging from 11 percent of people entering nursing homes in the top 5 states to 27 percent in the bottom 5 states. New Medicaid Beneficiaries First Receiving Home- and Community-Based Services. Because many people who enter nursing homes never return home, it is important for state Medicaid programs to provide LTSS to beneficiaries first in their homes and communities if possible, rather than waiting until they go into nursing homes. More than half of the states (29) showed significant improvement in the percentage of new LTSS users who first received services in the community. The 8 states with the greatest improvement were Montana, Pennsylvania, Maryland, Iowa, Delaware, Louisiana, Vermont, and Nebraska. However, 30 percent of new Medicaid beneficiaries first receive services in their homes and communities in the bottom 5 states compared with 80 percent in the top 5 states. Nursing Home Residents with a Burdensome Transition at the End of Life. One out of four nursing home residents was hospitalized at least once at the end of his or her life in 2013. While more work needs to be done, more than half of the states (29) made significant improvements in reducing potentially burdensome transitions for people who die in nursing homes. The top-performing states are Alaska, Idaho, Vermont, Wyoming, and Hawaii. Louisiana improved the most, with a 14 percentage point reduction. Employment for Working-Age People with Disabilities. Jobs bring income and meaning to peoples’ lives. Adults with disabilities are much less likely to be employed than people without disabilities. Even among the top-ranked states in this area (Nevada, Rhode Island, Wyoming, West Virginia, and Oregon), the employment rate was just one-third of the employment rate for all working-age adults. Long-Stay Nursing Home Residents Transitioning Back to the Community. State and federal initiatives have aimed to help long-stay nursing home residents of 90 or more days move back into the community. The top 5 states were Utah, Oregon, Washington, Arizona, and Idaho, in which an average of 12 percent of long-stay nursing home residents transitioned back to the community. By contrast, the average rate of transitions was just 5 percent in the bottom 5 states. Since the last Scorecard, 21 states have seen a significant decline in the rate of these transitions. There are no national, uniform measures of quality in home- and community-based services across the states. Millions of people receive services at home or in communities, but little is known about their quality of care or quality of life. Although many efforts to identify, propose, and develop consistent quality measures are ongoing, there is no uniform, consistent, and reliable source of data across all states for home- and community-based quality. The quality dimension in this year’s Scorecard is down to just three measures due to discontinuation of past measures and unreliability of data for others. Remaining measures include two for nursing homes and one for the employment rate of people with disabilities. With these limitations, the dimension is given only half the weight as the other dimensions in calculating overall LTSS performance. More affordable and accessible housing and transportation are needed to help people remain in their homes and communities. Lack of access to affordable housing and transportation options are substantial barriers to being able to live in the community. For the first time, this Scorecard has housing and transportation measures. Subsidized Housing Opportunities. This new measure captures the total amount of subsidized housing opportunities—including Low-Income Housing Tax Credits, HOME funds, Housing Choice Vouchers, and loans and subsidies—divided by the total number of housing units in a state. Since 2011, more than half of the states (28) significantly increased the percentage of housing units that can potentially be subsidized. The top performers were the District of Columbia, New York, Rhode Island, South Dakota, and Massachusetts. Despite the significant increase in 28 states, there is still an affordable housing crisis in our country. The total number of subsidized housing opportunities has risen since 2011 due to slow growth of the overall housing market and the increased use of vouchers, tax credits, and other financing mechanisms. However, it still falls short of current and future needs. Nationally, there are more than 18 million renters (most of whom are cost-burdened by housing) and fewer than 8 million potentially subsidized units. For people with substantial LTSS needs, simply having a relatively high number of affordable units is not enough. Housing also needs to be accessible to meet the needs of people with disabilities. Transportation Policies. Access to transportation is one of the biggest barriers for people who do not drive but want to live at home and in the community. Access to transportation ensures that people with LTSS needs are able to get to medical appointments, shop for food and other necessities, and see friends and family. Coordinating community transportation at all levels of government through human services councils that work together to reduce duplication and better serve the community. The top-performing states are Colorado, South Carolina, California, Massachusetts, and Washington. Where you live matters because states vary greatly in how long-term services and supports are provided. 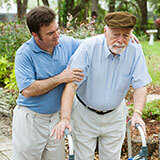 Nursing Home Residents with Low Care Needs. States having a high proportion of nursing home residents with low care needs suggests that more must be done to transition these individuals to less-restrictive settings or divert them from institutional care. In the top 5 states, 5 percent of nursing home residents had low care needs compared with the bottom 5 states, in which 21 percent of residents—four times as many—had low care needs. Medicaid LTSS Balance. Despite overwhelming preference among people with disabilities to receive services in their homes and communities, the majority of Medicaid LTSS spending for older people and adults with physical disabilities goes to nursing homes. The median state spent twice as much on nursing homes as on home- and community-based services, and only 10 states spent more on home- and community-based services than on nursing homes. States varied considerably on this measure: the percentage of funding going to home- and community-based services in the top-ranking state (Minnesota, 69 percent) was almost five times that of the bottom-ranking state (Alabama, 14 percent). If all states performed as well as the top-performing state or even an average of the top five states, millions of people with self-care needs would have additional options and support. Exhibit 10 shows how many more people with LTSS needs would be served if all states performed as well as the top states for just two indicators: Home Health Aide Supply and Low-Income People with Disabilities with Medicaid. Even where progress is being made, the current pace of change is often insufficient. Although most states have experienced modest improvement over time, the pace of change is not keeping up with demographic demands. For instance, the shortage of direct care workers is not meeting the demands of people with disabilities and older adults who are primarily living at home and in the community. Although nearly half of the states (24) have significantly increased the number of home health and personal care aides, at the current national rate of change it would take 34 years for the average of the bottom 5 states (11 aides per 100 adults with disabilities) to reach the level of the median state today (19 aides per 100), and another 34 years for the median state to reach the level of the average of top 5 states (33 aides per 100). To reach these benchmarks by the year 2026, when the baby boomers begin to turn 80, the age that begins the period of peak need for LTSS, the rate of improvement must triple. States have made steady but slow progress in increasing the proportion of Medicaid spending going toward home- and community-based services from 39 percent in 2011 to 41 percent in 2014, the most current year of available data across the states. At the current national rate of change, it would take 36 years for the average of the bottom 5 states (17 percent toward home- and community-based services) to reach the level of the median state today (33 percent), and another 51 years for the median state to reach the level of the average of the top 5 states (64 percent). To reach these benchmarks by the year 2026, the rate of improvement must triple and quadruple, respectively. Measurement, federal and state initiatives, and stakeholder engagement can accelerate the pace of change. The measures that showed the most improvement came in areas in which a range of stakeholders as well as federal and state agencies have worked together to improve care and access to needed services. A reason for the improvement in antipsychotic use in nursing homes, for example, was that the US Centers for Medicare & Medicaid Services partnered with other federal and state agencies, state coalitions, nursing homes, and consumer groups to reduce its use, monitor progress, and report the results publicly. Another example is around person- and family-centered practices that support family caregivers. Consumer and family caregiver engagement as well as national and state attention led to more states assessing family caregivers for their own needs and enacting the CARE Act to support individuals upon discharge from a hospital. Medicaid is a major driver of change. States with Medicaid programs that provide coverage for more low- to middle-income Americans with disabilities as well as a greater balance of home- and community-based services have higher-performing LTSS systems. Because Medicaid is the largest public payer for LTSS, it can stimulate market change. In the absence of a broad public program to ensure access to affordable LTSS, Medicaid remains the program of last resort for middle-income Americans. However, most people who need LTSS are not on Medicaid; but even those who are not can benefit from the LTSS infrastructure that develops around strong Medicaid programs. State officials have great flexibility regarding Medicaid policies in the current environment and this determines the types of LTSS offered and the settings in which they are provided. They establish the eligibility standards for Medicaid coverage. Their decisions can directly affect access to home- and community-based services and choice of services and providers. Consistent and reliable quality data—particularly in home- and community-based care—is imperative. A high-performing system should focus on outcomes and help individuals experience quality of life and satisfaction with services. Over time, the delivery of LTSS has shifted toward more home- and community-based services. However, the lack of nationally comparable sources of quality data on home- and community-based services is the largest data gap in the Scorecard. While states are making progress, it is time to accelerate these positive gains to meet the growing demand for high-quality LTSS in all communities. As people with disabilities live longer and baby boomers grow older, the need for LTSS will increase significantly, both in numbers and as a percentage of the US population. Older adults and individuals with disabilities want to be independent, have control over their own decisions, and receive assistance to maximize their functioning and independence in their own homes and communities. However, the experience of people with LTSS needs and their families varies widely depending on where they live. Every state—even the top-ranked state—has room to improve. State officials have a variety of legislative, regulatory, budgetary, and programmatic levers to drive needed reforms. State administrators, stakeholders, and others can use this information about their state’s performance to pick up the pace on creating and sustaining a high-performing system of care for older people and adults with disabilities, and their family caregivers who assist them.